Biological batteries, new vaccines and more cost-effective pharmaceuticals are just some of the potential benefits of Maurice Wilkins Centre research into the use of so-called molecular superglues. "It's big, it's important and we've only just started publishing this work so we think there'll be a lot of interest," says Associate Professor Chris Squire from the University of Auckland's School of Biological Sciences. "We're taking something that nature uses to make very thin long proteins strong, and turning this into an equivalent of superglue to stick other proteins together," says Chris. The work was inspired by the long thin filaments used by bacteria to stick to surfaces such as teeth. The proteins in these filaments are strengthened by special bonds within the protein molecules that Chris and his collaborator Dr Paul Young helped characterise. Using the technology developed by Chris and Paul, up to a dozen different proteins can be joined together in a specific spatial arrangement to build highly complex protein nano-materials. The researchers liken these to trees, where the proteins form a central trunk with numerous branches in a pre-determined design. Using so-called 'molecular superglue', up to a dozen different proteins can be joined together to construct highly complex nanomaterials, which have been likened to protein trees. 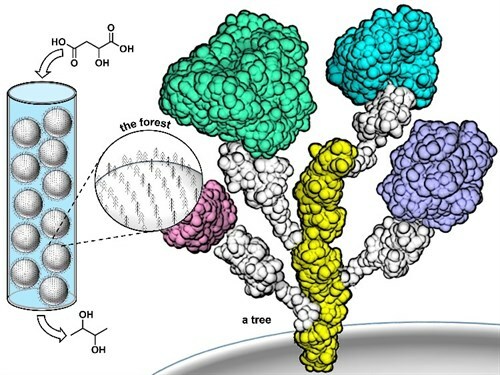 As Chris says, "we have this really exquisite control over which proteins we stick together, in which order, and in which location on our tree." And yet, as Paul puts it, the molecular design means "we just mix it all together and spontaneously the proteins form this structure. It's a self-forming scaffold that can't come apart." Over the past decade, overseas researchers have identified three or four molecular superglue variants. However, the Maurice Wilkins Centre research has uncovered another ten variants in just 18 months thanks to some hard work by MSc and PhD students. "We're now doing molecular superglue exponentially better than previous methods," says Chris. "We're way ahead of where we thought wemight be at this stage of the project." The ability to hold different proteins together lends itself to enzymes that are part of the same metabolic pathway - building very futuristic sounding "synthetic metabolons". For example, where chemically-complex natural products have shown potential as medicines, the process of making sufficient quantities for medical use could only be short-cut by combining a series of enzymes to carry out the trickiest parts of the chemistry. "Maybe we can identify things that are in the 'too difficult' basket for traditional synthetic chemistry," says Chris. "It's that combination of synthetic chemistry and biosynthesis that could be really powerful and useful in medicine." Other possibilities range from joining antigens together to produce new vaccines, to the creation of a biological battery that could be implanted inside the body and powered by glucose in the bloodstream. As Chris says, "we've got two or three different things that we're working on, but it's limited only by our imagination - and by funding of course!"